If you haven’t made it to Cadbury World so far this summer, there’s still plenty of school holiday time left to treat the kids. Our friends over at Cadbury World reveal their plans for this summer! 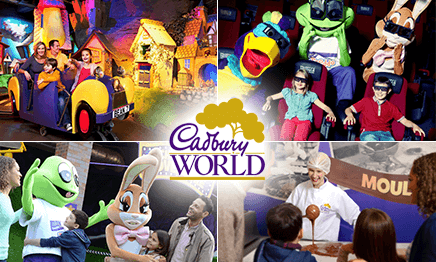 It’s set to be a summer choc-full of fun at Cadbury World this year, with a series of exciting events taking place from 18th July – 2nd September. Celebrating its 25th anniversary this year, the Bournville based attraction is gearing up for one of its best summers yet. Throughout the school holidays, a range of entertainers will be taking to the stage in Cadbury World’s outdoor marquee for the whole family to enjoy. Captivating performers, including magicians and ventriloquists, will be showcasing their extraordinary talents to delight visitors of all ages, in a number of fun-filled shows throughout the day. Visitors will also have the chance to meet and greet the iconic Cadbury Characters, as Freddo, Caramel Bunny, Creme Egg and Mr Cadbury’s Parrot are on hand to pose for photos. An extra special addition will also be swooping into Cadbury World this summer, as a brand new character is unwrapped on 20th July as part of The Big Hoot project. The exclusively designed owl will take up residence at the Bournville based attraction until 27th September, giving visitors another opportunity to snap a photo with the exciting character. Cadbury World is home to 14 amazing zones to explore to ensure your visit is choc-full of fun. The 4D Chocolate Adventure zone is one not to be missed giving you the chance to experience the feeling of diving into a pot of melted Cadbury Dairy Milk chocolate, riding the Crunchie Rollercoaster and taking to the skies in a Cadbury Creme Egg airship piloted by the Caramel Bunny, all without leaving your seat. Be sure to visit the revamped Purple Planet zone too, featuring new and improved interactive games with a chocolate twist. The new-look zone is full of fun challenges, including a memory-testing sequence game on a giant cocoa pod, interactive floor games including a projected bubbling chocolate pond, as well as the chance to grow and nurture your own virtual cocoa tree. Watch the chocolatiers work their magic in the popular Chocolate Making zone as they demonstrate traditional chocolate-making skills, before taking a stroll through Advertising Avenue, where you’ll find the iconic drumming gorilla alongside some other much-loved adverts. Make the most of any sunshine in the outdoor African Adventure Play Area, filled with tube slides, climbing zones and rope bridges. With a separate under 5’s zone for mini-explorers to enjoy, it’s the perfect place to visit before or after your exhibition tour. With lots more on offer, including the World’s Biggest Cadbury Shop and the onsite Cadbury Café, Cadbury World is the perfect destination for a chocolate-themed day trip this summer. Have you entered our Competition? We have a Family Ticket to give away of 2 Adults and 2 children! Enter here!